Following on from my Top 11 things to do in Sydney Winter post, I thought I’d share with you my favourite ‘get out of Sydney card’ place to go to during winter; the Blue Mountains! I was talking to an expat friend the other day about how much I love these mountains and she asked what was there to do apart from going to the obligatory Three Sisters look-out point. This made me realise that a post was in order, and seeing as I spent the day there again today, here are my Top 6 things to do in the Blue Mountains. I always drive up but only a few of my tips will involve using a car. You can easily get there by catching the train from Sydney which is just a two hour journey. I’m going to show you what I did today which is pretty much what I usually do with a few extra’s added in. I tend to head straight to Katoomba, the main town in the Blue Mountains where I’ll start my day by heading to Up Beet Juice and Vegetarian Cafe, (only the number 1 place to eat in Katoomba on Trip Advisor) for a Green smoothie. This place is awesome and the food is really good and super cheap (probably the best soup I’ve ever had for $8.50). After I’ve had my fix of greens, I’ll then wonder down the main street of Katoomba and check out the vintage stores. There are a good few vintage and antique shops on the main street and you can find some amazing gems. They are also pretty cheap as well. I got a great seventies dress for $29 today. After a few hours of browsing (and shopping) the vintage shops, I then recommend heading over to Yellow Deli which is an awesome cafe located again on the main street of Katoomba. I often tell people about this place for its unique setting. Ran by The Twelve Tribes, they are a community that live together who all have a strong belief in God. I’m not religious in the slightest but their cafe is amazing. They found all of the wood and built the cafe themselves and I think once you know that you really start to take note of how amazing the different types of wood there is and how incredibly innovative they were at building the dining spaces. 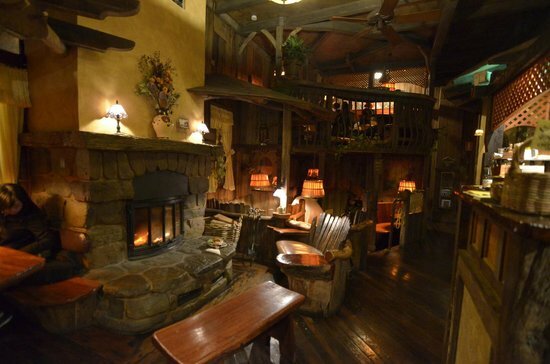 Each dining space is different and it’s a real gem to sit in and feel right at home especially as there’s a fire place too. The staff are really friendly and I absolutely love this place. 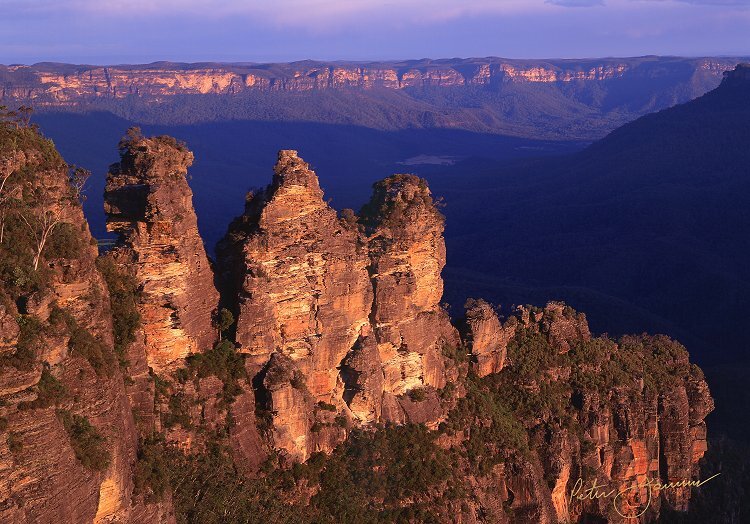 If you are heading over to the Blue Mountains especially for the first time, you have to visit the Three Sisters, the most iconic spot in the whole area. Flooded with A LOT of Asian tourists, its definitely worth popping over for a visit to the lookout point. If you’ve got the train up, there’s a ‘trolley’ bus that drives through Katoomba’s main street picking people up to drive 5 minutes down the road to the look out point daily. I then usually head straight to the Paragon Cafe for an afternoon cup of tea and as a treat, one of their famous chocolates which are made in house. It’s also Australia’s oldest cafe and has a brilliant art deco feel to the place. They also hold a 1950’s Christmas in July complete with music, stories and prizes every Saturday night during the month. Please note – unless you like burgers, I would only go there for tea and cake. Even though I don’t eat red meat, their burgers looked good but there wasn’t much more to the menu other than different variations to the dish. OK, this is the biggest gem of them all, my absolute favourite spot in the whole of the Blue Mountains. You’ll need a car to get here but 35 minute drive out of Katoomba past the newly re-opened Hydro Majestic Hotel (also worth a visit) lies the most beautiful part of the Blue Mountains, Hargraves look out. It’s located in the middle of a valley and has a stunning silence that makes you really feel that sense of space and freedom that Sydney can zap right off you. I always make sure I head here everytime I come up to the Mountains. It’s just stunning! I’ve stayed up in Katoomba once before and stayed right opposite the Three Sisters at Wynradyne Boutique Bed and Breakfast. This place was awesome. The owner is so proud of her business and cooks up an amazing breakfast where you’ll sit in the dining room over looking the Three Sisters. Expect a jacuzzi in your room where rates start from $170 a night. If you are on a tight budget, there’s a YHA in Katoomba catering for backpackers in shared dormitories and double / twin rooms. Got an extra day to spare? If you’re going to spend the whole weekend up in The Blue Mountains then there’s so much more to do. I absolutely love Leura which is a lovely little town near Katoomba. If you head over, make sure you visit the Deli. It has excellent food and a great view of the mountains. Jenolan Caves is also definitely worth a visit. The drive over there is worth it alone. I am a huge fan of the countryside and it’s absolutely beautiful where you eventually drive through the caves to park up and join one of the guided tours. Please note, the temp drops dramatically down there so wrap up but it’s stunning as you can see in the pic below! And lastly… go on a hike! There are so many amazing hikes in the mountains! I spent the day walking through so many waterfalls, it felt so tropical that I couldn’t believe I was less than two hours out of Sydney. Click here for more information. Thanks for reading and if you enjoyed this post, please share on your social media pages!